Yeah… the fun continues. 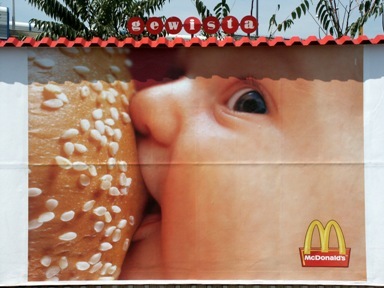 While keeping up on the McDonalds traffic at Technorati, I stumbled on a different baby ad on a different blog. The author mentioned searching for “baby McDonalds ad”, so I gave that a go and tracked down a little more info. Once again all good things lead back (or near) Boing Boing, who posted the mcboob stuff last April. And to make things better, they validated the ad by linking to the ad company that originally put it out. McDonalds is funny. Ok, time to find something non fast food to post. "Prequel to Yesterday’s Creepy – The McBoob" by Jeremy Felt, unless otherwise expressly stated, is licensed under a CC BY-SA 4.0 International License.